There’s a lot of considerations to be accounted for when choosing your first (or subsequent) shed. Here we’ll look at a few of the fundamental choices, and legal concerns when buying a shed. We’ll start with the least enjoyable aspect of the process… If you live in an urban or suburban environment, you’ll want to know your town or city policies in regards to building a structure. There may be building codes that limit the shed’s size or height, or how close it can be to your home or to your neighbor’s yard. Some neighborhoods also have more specific rules and regulations that need to be kept in mind. On the other hand, knowing these regulations may help you narrow your selection and site for the project. Always do your research first to avoid unnecessary fees, building delays, and general frustration! Here are some more agreeable aspects to consider. Will you be using your shed primarily for storage? If so, try to make a rough itemized list to help you determine sizing, including the door width and height. Are you planning on spending a lot of time working in your shed as a workshop? Make sure you have the proper headroom, ventilation, walking space, and lighting for comfort and accessibility. As a general rule of thumb, consider purchasing a shed that is about 25% larger than is necessary for its intended use, this way you can safely adjust and modify the space appropriately. No matter what kind of shed, or its purpose, you’ll need to start with a foundation to keep the structure level, and to prevent damage from water and other environmental factors. Small storage sheds can make do with simple kit platforms or even a layer of pea gravel on a leveled surface. If you’re working with larger structures or thinking of using your shed as an alternative housing solution for people or animals, concrete slab or timber framed foundations will provide better protection, insulation and be longer lasting. When it comes to selecting your shed material there’s only a few choices: wood, metal, and vinyl. Aesthetics plays a big role in this choice, but there are some other factors to consider as well, and we’ll briefly look at these components. Wood is the most classic of the three options; is a step up in both quality and durability, and it’s the most customizable as well. A wooden shed can easily be painted, and be built with any interior design in mind. Wood is a strong, long-lasting material, but it may require a bit more maintenance than metal or vinyl type sheds given that it is more vulnerable to water and insect damage. Wooden sheds also tend to be a little more expensive and may be a bit more labor-intensive to set up, but often the extra initial work pays off in the long run. Our Wooden storage solutions typically come complete with a raised wooden floor, seven feet or more of interior headroom, sturdier doors and roofs covered with residential-type composition shingles – some even have windows and skylights. 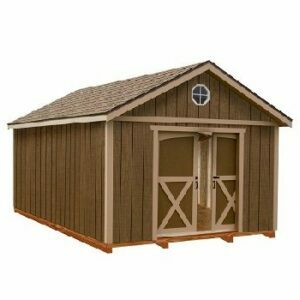 Wood sheds are available in barn, ranch, lean to and loft styles, and with everything from inexpensive wafer board panels for siding up to clear cedar lap siding. They are also available pre-painted, or you can get one that’s either unpainted or pre-primed so that you can paint it to match your home. 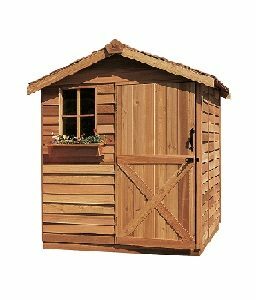 Because of their weight, heavy duty wood sheds are usually built and sold locally. They also are usually delivered to your site at no charge. Many options are available including windows, double doors, skylights, metal roofing, roll-up doors and special siding. Depending on the size and installation method of the shed, a building permit may be required, so be sure and check with your local building department before purchasing a shed. Also, check with your homeowner’s association to make sure there are no restrictions on installing a shed in your neighborhood. 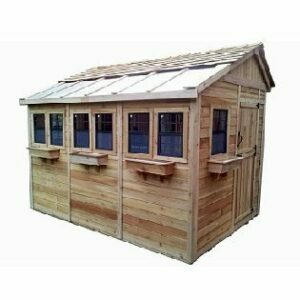 Our cedar shed kits are easy to assemble and provide an attractive solution for all your outdoor, backyard and garden storage needs. These cedar shed kits are panelized for quick assembly and include floors, pre-shingled roof panels, pre-hung doors, and windows. Wood sheds made from cedar are the most durable. They are not the least expensive but the have a very long life and are aesthetically beautiful to look at. These storage solutions look classy and beautiful, are strong, long lasting, non-toxic and smell great! Have you ever had a cedar chest or cedar closet? These natural oils also help the wood resist insect attack and decay and come in a wide variety of shapes and sizes. Vinyl, also called resin or plastic, is a good choice for basic storage needs. While not as customizable as wood type sheds, they are easy to set up and virtually maintenance free since they are waterproof, UV-protected and do not require any painting or staining. Often they are light in weight but still retain their strength, and there are many different styles available. Vinyl is a quick and efficient solution to smaller storage problems, there are a variety of storage buildings made from vinyl composites. They are impervious to insects and just about any weather conditions, and won’t dent, chip, rust or otherwise deteriorate. Duramax® vinyl sheds are the industry’s leader in quality and functionality. View our collection of Duramax vinyl sheds to find the perfect backyard or garden storage solution for you! Our Duramax vinyl storage sheds do not include floors. Flooring and anchor kits are additional. Vinyl sheds and utility buildings are the longtime permanent storage solutions. The optional Foundation Kits are an excellent method of securing your Duramax shed to the ground. 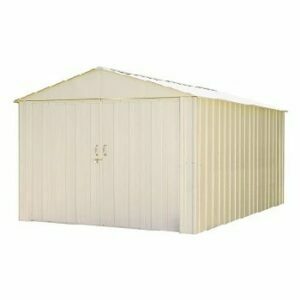 Metal sheds are an inexpensive solution, also best for basic storage. They’re often times less expensive than vinyl, but do require a bit more maintenance to avoid rust. Metal is also heavier than vinyl and may not be as aesthetically pleasing to some customers. 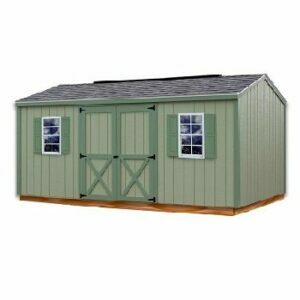 Metal sheds are one of the most common solutions for backyard storage is the metal shed, available in kit form. There are a wide variety of sizes and styles to choose from, as well as many different colors, roof designs, door configurations, and price ranges. By far, Arrow is the leader in the manufacturing and distribution of steel sheds and is the “low-cost storage solution”. You’ll find metal shed kits in sizes ranging from as small as around 5 feet by 4 feet to 14 feet by 31 feet or even larger. Smaller sheds may have only a single door, and the headroom will be limited. With the larger kits, you get double doors and enough clear height inside to stand and move around comfortably. Metal sheds are sold in kit form, and while they’re relatively easy to assemble, they do require a few basic hand tools and fairly large amount of patience – the typical kit has a plastic bag full of screws and nuts that seem sufficient to assemble a small battleship. This is one time where it really pays to lay out and check all of the parts, and follow the instructions carefully to ensure a trouble free assembly. Ensure the ground is level and building is squared for the easiest assembly. For best results, mount the shed on a floor of concrete or pressure-treated lumber, or use one of the metal foundation kits that are sold as an option with many kits. Mounting the shed to a solid surface is especially important in high wind areas, where the lightweight enclosures might otherwise have a tendency to depart your yard at an inopportune moment. Taking the extra time to determine what you want out of your shed, along with knowing your local laws, will help you narrow your search. Once you know the right size and foundation for your project, you can begin your investigationfor the perfect match!